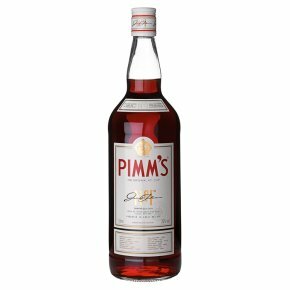 The archetypal sunshine drink, Pimm's is a unique blend of gin liqueurs, fruit extracts and herbs, still made to an original recipe from 1840. Serve with lots of ice, lemonade, mint and slices of cucumber, though some purists consider that adding Champagne makes it the true No.1 Cup! Pimm's is a gin based drink with a refreshing taste, comprised of a blend of spirits and orange fruit flavours. Pimm's is a Royal Warrant Holder. Complex fruity notes of bitter sweet caramelised orange and citrus, perfectly blended with sweet warming an intriguing savoury spice notes, with a fresh citrus & soft bitter herbs finish. To make a Pimm's No.1 Cup pour 50ml Pimm's No.1 over ice, add 150ml chilled lemonade, garnish with lemons, cucumber, strawberries & fresh mint. Pimm's No.1 contains 25% ABV. Pimm's No.1 is the perfect drink for sharing; making every occasion extra special and deliciously memorable.Ever since James Pimm first mixed a jug of this astonishing tipple in 1840, Pimm's has existed to politely but firmly insist that there are more important things to do than writing ?to do? list?like catching up with good friends. Pimm's No.1 is the perfect drink for sharing; making every occasion extra special and deliciously memorable. Take a jug (or long drink glass) and fill it with ice. Mix one part Pimm's No.1 with three parts chilled lemonade. Then add some mint, cucumber, orange and strawberries - and enjoy. Pimm's® is very versatile and can be mixed to suit your personal taste.